Accommodation was a spacious townhouse with off street parking. Value for money budget accomodation, very friendly staff. They had a pool, tidy bathroom and its location to the beach. Having everything that was needed in the unit. Near the beautiful beach. Parking. Friendly staff. Privacy. Own private stair way. Great air conditioning. Good shower pressure. Nice white fluffy towels. Great lighting. A cute library. Mario was very friendly. Good value for money apartment. Was able to self cater. Not far from the beautiful Strand. Pool was refreshing. The apartment was clean and spacious. Great location to the sport we were there to compete in and restaurants and shops. Very close to the beach and nice walking around there. Lock in a great price for Palm Waters Holiday Villas – rated 8.3 by recent guests! 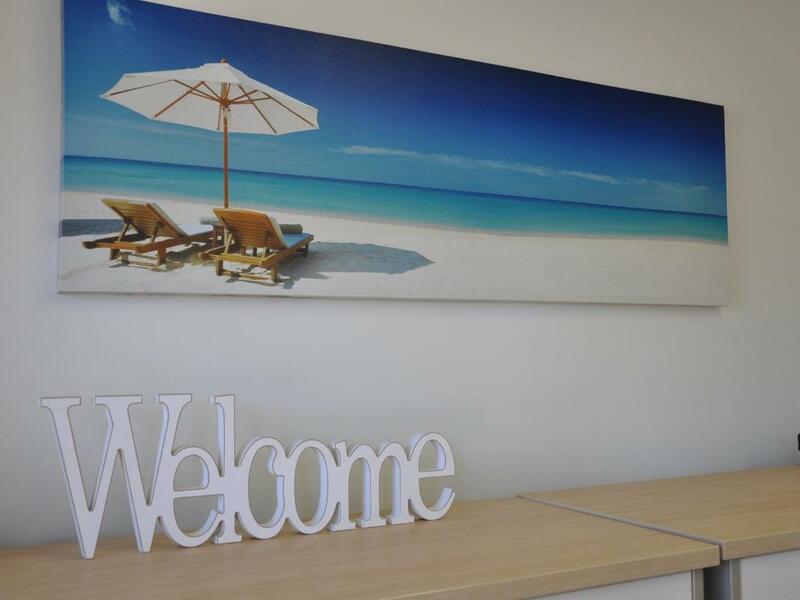 Palm Waters Holiday Villas This rating is a reflection of how the property compares to the industry standard when it comes to price, facilities and services available. It's based on a self-evaluation by the property. Use this rating to help choose your stay! Just 1,300 feet from The Strand Beach, Palm Waters Holiday Villas offers an outdoor swimming pool and a barbecue area. A full kitchen is standard in all apartments. Free parking is available on site. 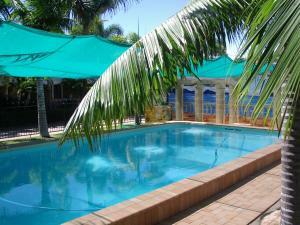 Townsville Palm Waters Holiday Villas are 5 minutes’ drive from Reef HQ and Townsville Entertainment Center. Townsville International Airport is a 10-minute drive away. All apartments have cable TV and a separate lounge and dining area. Each apartment has a kitchen with an oven, a microwave and a refrigerator. Some apartments also have laundry facilities. When would you like to stay at Palm Waters Holiday Villas? This apartment features a full kitchen with a microwave, oven and refrigerator. It also has a separate living and dining area with cable TV. This apartment features laundry facilities and a full kitchen with a microwave, oven and refrigerator. It also has a separate living and dining area with cable TV. This family room features air conditioning, washing machine and electric kettle. This apartment has a dining area, private entrance and kitchenware. This holiday home features air conditioning, iPod dock and microwave. Please note this property is located at 45 Klewarra Blvd, Douglas, which is a 15-minute drive from the city. Our property is a family owned and managed business, we aim to give people personalized service and care while they are with us. I have lived in Townsville for most of my life I love this city and can give advise on many things to do and see. I have been managing holiday units for 14 years, I love meeting people from all walks of life. I enjoy traveling, any sports and time with my family. Located 5 minutes from Townsville's waterfront The Strand, Jezzine Barracks and various restaurants and Cafes. 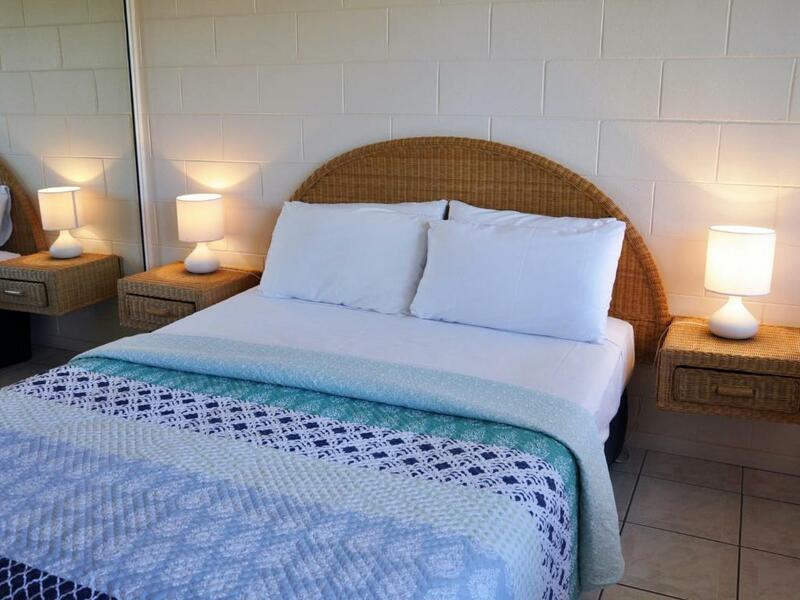 Enjoy the convenience of being close to the beach and a short drive from the city centre. House Rules Palm Waters Holiday Villas takes special requests – add in the next step! Palm Waters Holiday Villas accepts these cards and reserves the right to temporarily hold an amount prior to arrival. If you expect to arrive outside reception opening hours, please inform Palm Waters Holiday Villas in advance, using the contact details found on the booking confirmation. Please note that there is a 3% charge when you pay with American Express credit cards. There is no additional charge if you use a Visa or Mastercard credit card. Please note that not all apartments are fully air-conditioned. If you require a fully air-conditioned apartment, please request this in advance using the contact details found on the booking confirmation. Please note that check-in and key collection take place at: 36 Landsborough Street, North Ward 4810. Please inform Palm Waters Holiday Villas of your expected arrival time in advance. You can use the Special Requests box when booking, or contact the property directly using the contact details in your confirmation. Lounge/fold out bed is ready for the tip. One set of towels for a week is not good. The property needs a little bit of updating i.e. painting, new curtains (ours had pin holes throughout), some toiletries would have been nice. When I looked under beds in case anything had fallen underneath there was rubbish there some food scraps. I took it out and placed in bin. There was no blanket but I should of asked for one. Not much to dislike. Only thing was the grill in oven was not clean. Water pressure for the shower was very soft. Having a two bedroom apartment, meant that there were 3-4 of us. There could have been additional seating in the lounge area.